Following yesterday's launch of the new iMac with Retina 5K display, Other World Computing has announced RAM upgrade kits for the machines. These kits were previously available for the 2013 iMac, but they are also compatible with the 2014 machines. 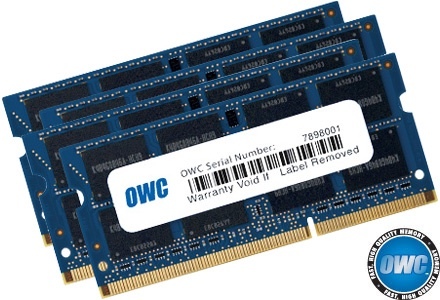 OWC is offering three separate 1600MHz DDR3L kits to upgrade the Retina iMac's memory to up to 32GB at prices lower than Apple offers. The 8GB kit, priced at $101.99, will increase the RAM of a base Retina iMac configuration from 8GB to 16GB. The 16GB kit, priced at $197.99, will increase the RAM of a base Retina iMac configuration from 8GB to 24GB, and the 32GB kit, priced at $395 kit will allow users to replace all memory for a total of 32GB of RAM. When purchased from Apple, upgrading to 16GB of RAM total costs $200, while upgrading to 32GB of RAM costs $600. OWC's 32GB kit is $200 less than Apple's price, and while the 16GB OWC kit is priced the same at $200, it ultimately lets users install 24GB of RAM rather than 16GB of RAM. OWC is also offering a trade-in rebate for original factory memory, giving customers a credit towards the purchase of a memory kit. OWC's memory kits come with a limited lifetime warranty along with a lifetime advanced replacement program. Released yesterday, Apple's iMac with 5K Retina display can be purchased from the Apple Store for $2,499. Current orders ship out in three to five business days. Crucial.com offers 32gb for only 330$, and I think it's the same OEM brand that Apple uses for most of its computers. Just pressed the purchase button on my new iMac 5K...now the agony of waiting for it to ship begins. The RAM slots are designed to be accessible by the user, plus Apple provides documentation for how to replace the RAM yourself, so I doubt that it voids the warranty. Surprise! It's still user upgradeable AND accessible! If I'm not mistaken, that makes the 27" iMac as the last consumer Mac with user replaceable RAM. Which I'm happy about! But I was worried Apple would do something drastic with this new retina iMac and solder it on like they did with the rest of their lineup, or (in the case of the 21" iMac) socketed in an all but inaccessible iMac casing. I believe even the retina MBPs might be soldered on? I can't wait to see what OWC will be able to offer for the new Mac Mini: quad processors, etc. I don't see how that is going to be possible. Why do you think that. Clearly states on the Apple store page, for the iMac 5K, "(four SO-DIMM slots, user accessible)". :apple: dropped the ball on this one! The iMac too should be completely soldered, options are evil! Upgrades should only be made by Apple and priced so absurdly "like ony Apple can"! i just read a story that said the memory is soldered in as well in the new Mac Minis. I really would like to know the REAL reason why they are soldering everything in now in days. So the iMac's RAM can be upgraded but the Mac mini now cannot??! I don't think this is going to be possible, the Mac mini CPUs were never upgradeable (except for the very first gen, non-unibody that had socket replaceable CPUs). It's going to be soldered to the motherboard, same with the 2012 and previous gens.